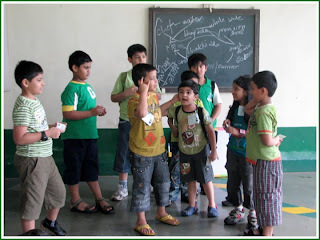 A hefty bunch of children from Kid’s Domain (an after-school) woke up early morning on Sunday July 11, 2010. Some of them even as early as 4 a.m., too excited to start the day. 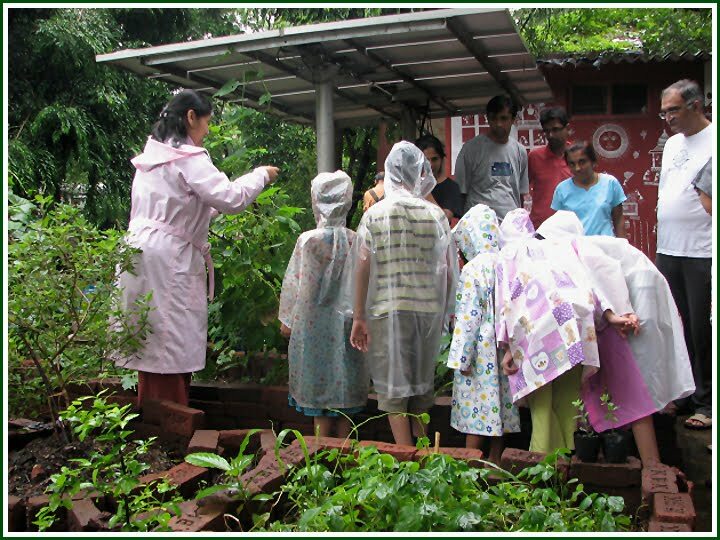 They hopped in a bus at Borivali which took them to Mahim Nature Park in drizzling rain. 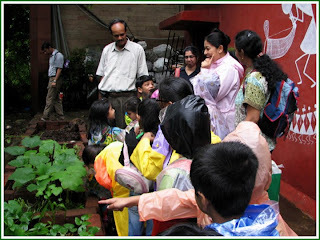 It was time to see the Urban Leaves’ garden there and get a hands-on experience of farming! Preeti, Julius and Purvita introduced children to the variety of plants at the garden. The children got to see Mint, Pumpkin vine, Chowli pods, Chickoo tree and even two small baby Guavas. During this stroll in the garden they also met some farmer’s friends such as Earthworms, Slugs and Millipedes. 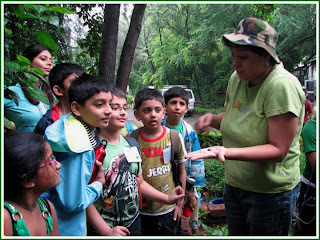 However, many kids did not perceive them to be very friendly going by the looks of these creatures. Slowly some kids started to touch them curiously when a brave little girl excitedly put an earthworm in her palm. Her amused look was so precious! From the garden they all went in the MNPS building to do some group activities and learn some more about farming. Here, Nisha told them their favorite pizza’s journey. 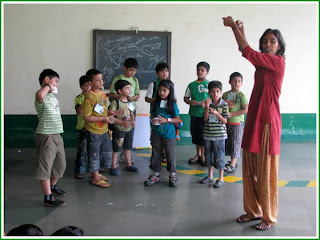 Little by little by the way of small skits, they learnt that their pizza originates from a farmer who grows vegetables. From there the truckwallas take it to wholesale shops. People buy these vegetables from shops and then they are taken to the kitchen where they are cooked and served. All the garbage generated in the process is picked up by garbage collectors and taken to local dump. 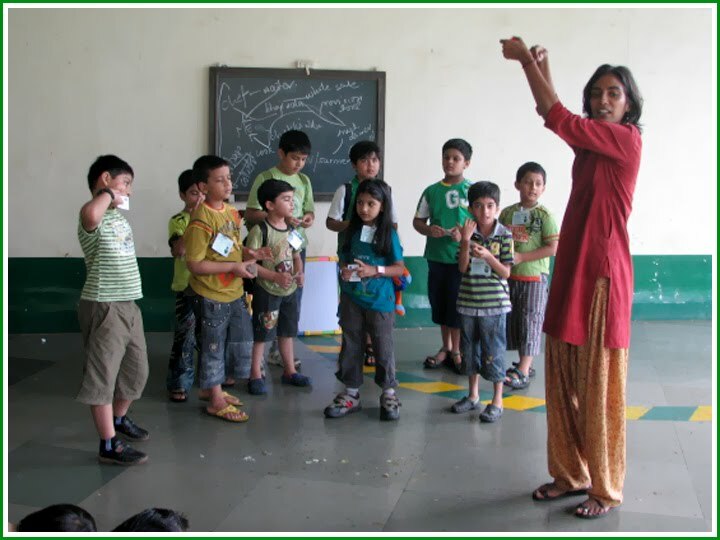 The idea of this exercise was to explain kids the complex process by which the food ends up in our plate every day. We do not know where it has been grown, what has been added to it and what removed. Rather than eating food this way, why not grow your own veggies and be a city farmer? After this activity they all saw difference between normal soil and Amrut Mitti and what would be a better way to do that than stick your hands in mud and feel it! Later they all had a chance to see various butterfly and moth caterpillars growing on plants. By this time, with all the action, kids were hungry, so after a quick chow break the activities were resumed. The kids were divided in groups again and each group was provided with mitti, sugarcane pulp, ash, netted containers and plants. 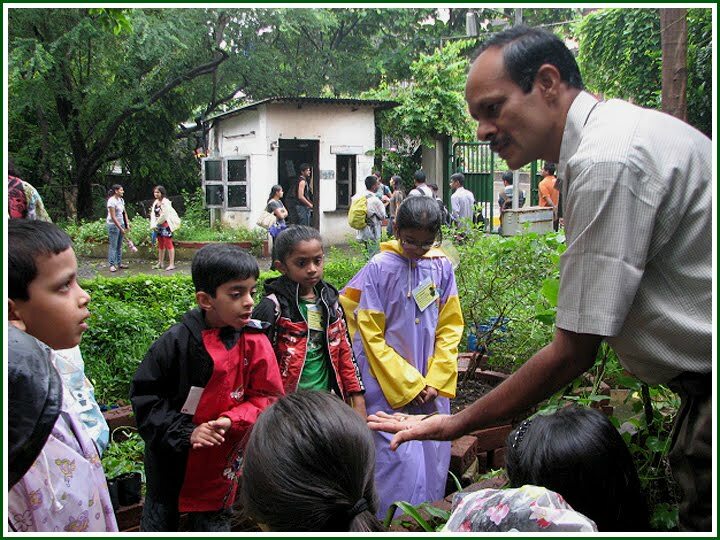 Each group had an experienced person from Urban Leaves to show children how to do the planting. 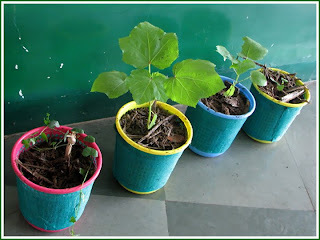 Soon, kids had plants like spinach and Bhindi to take away and grow. 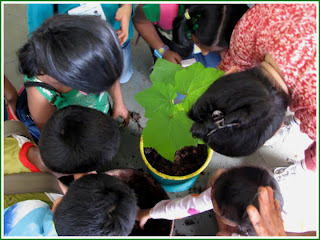 They were also given small containers with soil and a few seeds to plant at home. 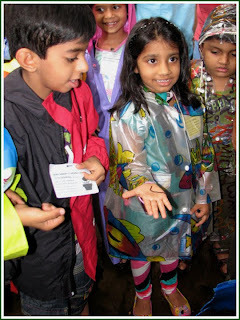 The day ended on a beautiful note as the children got to see a Tailor bird in nest on a small tree. This was a perfect way to know that a single plant has so many other creatures connected to it, including humans. Kids went back home already waiting for the seeds to sprout and the Kid’s Domain teachers with a plan to grow a nice little garden in their premises.